Academic Research Declares RAVE Act Has Failed To Protect Dance Music Fans! Over the weekend, an award-winning sociologist by the name of Tammy L Anderson, PhD., said everything we were all already thinking about with regards to the RAVE Act. She presented research at the annual meeting of the American Sociological Association entitled “Molly Deaths, and Why the Drug War Won’t Clean Up Rave Culture,” and it couldn’t be more correct. 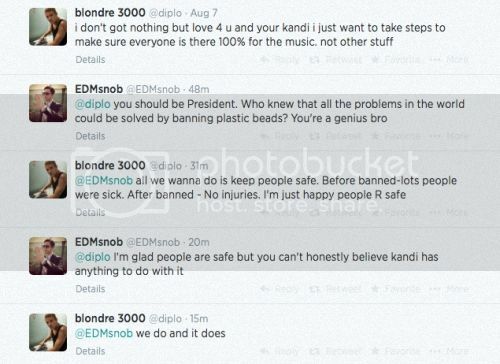 In case you’re not sure what I’m talking about, this will also explain why diplo recently banned “kandi” at Mad Decent parties. The short answer is, once it’s your party, you’re liable if kids do drugs at your rave. This is because of a 2003 law sponsored by Joe Biden, attached as a rider to the AMBER alert system, linked to above. The important thing is that it quickly started being used to attack EDM events, and the hallmarks of rave culture became liability used against producers of those parties. They “had” to have known that the kids in the Jncos, bottles of water, and kandi, were doing/selling drugs at their party. However, if they could convince people that they didn’t know, not give them water, cater to a non-rave-feeling crowd, & make it unfriendly to drug users, then if someone OD’s in the club, the promoter technically didn’t know it was a thing, and potentially isn’t liable. Because that makes sense. I’d imagine you agree with me that this makes no sense at all. And Dr. Anderson agrees with us. This chaotic environment punishes behavior that can be prevented through education, consistent messaging and encouraging producers to take care of their customers. Even the ones who make the “wrong” decisions. Organizations such as DanceSafe, the Electronic Music Alliance & others are attempting to help but the law ties the hands of anyone who produces events of even a modest size. This is a really important topic and how we handle it, collectively, will determine the future of EDM in the USA. More than 10 years ago, dance music culture was about to explode into the mainstream in the USA, then this law shattered the scene. Will this time be different? Picture via Magnetic Mag & write-up by Medical Press, additional thanks to Daniel Fowler of the American Sociological Association.